In 1995, the Western Lake Superior Sanitary District (WLSSD) installed two (2) Vulcan Industries Mensch reciprocating rake (climber) bar screens at its wastewater treatment facility located in Duluth, Minnesota. The screens were installed in 8’ wide channels with 3/4-inch bar spacing. Twenty years later, the District began taking steps to tighten the bar spacing to prevent downstream ragging and debris accumulation. The possibility existed to replace the rake heads and bar racks on the existing Mensch screens to a tighter bar spacing, but hydraulic constraints caused anxiety for all involved. Instead, the facility began looking at multi-rake screens with 1/4-inch openings that could ensure headloss across the screen remains at a minimum in blinded conditions. As well, a third channel could be included for mechanical screening in lieu of the existing two screening channels. 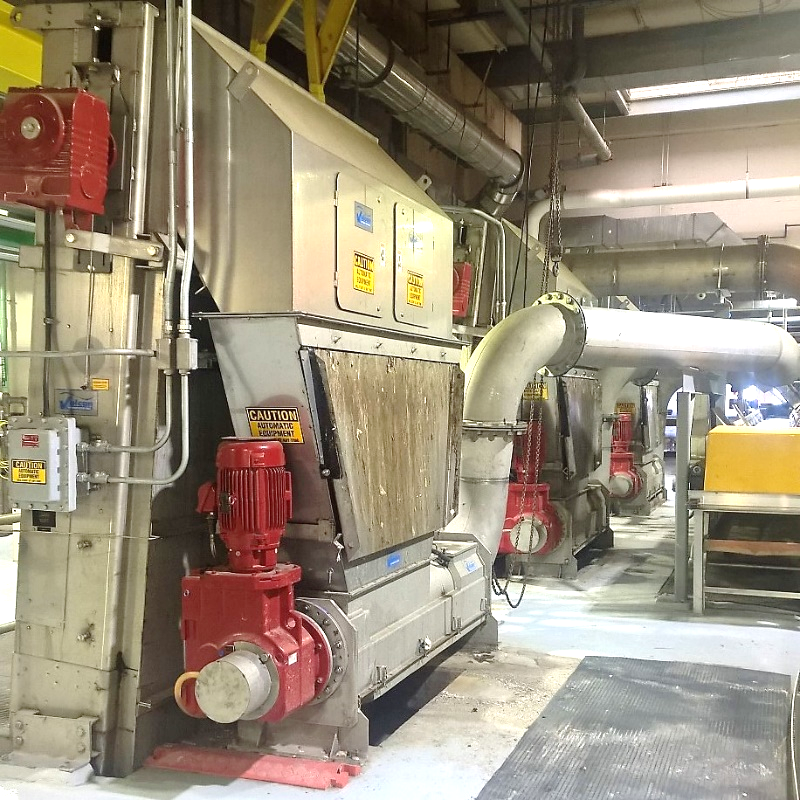 After a direct bid and evaluated process, three (3) Vulcan VMR-96 Multiple Rake bar screens and three (3) Vulcan EWP washing presses were selected. Important in the selection of a screen was the evaluation of headloss, as previously mentioned. The consultant on the project, Donahoe & Associates, Inc. (St. Louis Park, Minnesota), spent a considerable amount of time reviewing the two MOP 8 recommendations for calculating headloss; Bernoulli’s equation and Kirschmer’s method. As is the case with most installations, the installed screens have proven the Kirschmer method to be more realistic, as the headloss across the screen has been very near the anticipated hydraulic profile. Vulcan was instrumental in the design discussions and as always, appreciates the opportunity to get nerdy with screening hydraulics! When construction started and the existing Mensch screens were removed, WLSSD manager of operations and maintenance, Al Parrella, remembers that “when they (Mensch screens) were taken out twenty years after being put into service, they were like new.” This is a testament to the longevity of the Mensch Crawler Screen. Thanks, Al. Also instrumental to the success of this project was Steve Roberts of S. Roberts Company. Without the hard work and insight of representatives like Steve, projects like Duluth would not occur. Many thanks to all involved in making the Duluth project such a success!